4.0 inches square to be precise! I have used Papertrey's Butterfly Kisses stamp set, stamped in gold Encore ink on black card. 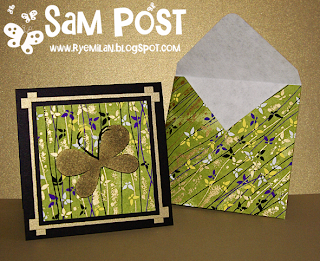 The cardstock is Basic Black and Brushed Gold from Stampin' Up! and the patterned paper is Chiyogami or Yuzen (brightly decorated papers in Japanese style)...MUY, MUY pretty! I have used Lin Mei Yap's really-easy-to-follow tutorial on making envelopes (which you can see here), and have made a matching envelope in Chiyogami paper. BTW, I was just setting up to take the photo and hubby walks past and goes...'pretty card, but I don't like the butterfly much!'. WT? I studiously ignored him...which spoke volumes methinks ;-). While taking the photo, I was using this jar to stop the background cardstock sliding around on the kitchen bench....and I just wanted to ask...who else thinks this whole naming debacle is just the bestest free advertising EVER? I think their advertising execs need a bonus over this...I bought two jars, one to taste and one just in case it is ever worth anything on ebay ;-). Okay...now that your minds are boggling over my gullibility, I'll go. Cute little card and envelope - and ignore hubby for sure about the butterfly!!! You made me laugh over the iSnack - wish I had thought of the ebay angle - though not sure HOW long you'll have to keep it - LOL. BUT Kraft have certainly got a LOT of notice with it - good strategy if that's what it was! LOVE the card and the envelope Sam...As for the vegemite...In no truer word than half my American friends...Yuck! As for free advertising...Well it was always about that...never about a new name...LOL!!! Hey there Sam! 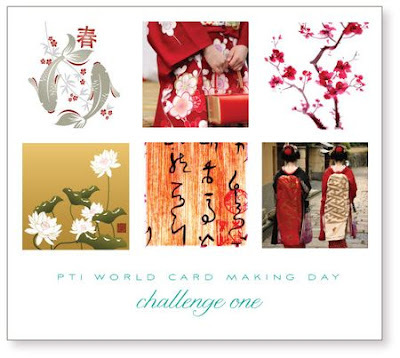 Your little card is way cute - perfect for that challenge! Well I hope I don't offend but your hubby has no taste,lol, the butterfly is cute. I really wanted to play along with this too but we were off on hols for a few days and didn't have time, nowhere as gorgeous as Figi mind you, just ol' Port Fairy. 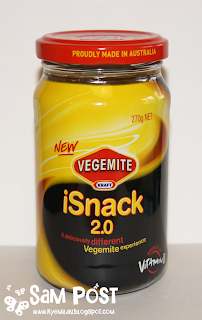 Now I want a verdict, what did you think of the new offering from Kraft?? ?